The PWD ID issuance is pursuant to the Republic Act No. 9442 as amendment to Republic Act 7277, otherwise known as the Magna Carta for Disabled Persons and For Other Purposes, these foregoing guidelines shall serve as a mechanism for the issuance of a Person With Disability Identification Card. Two “1×1” recent ID pictures with the names, and signatures or thumb marks at the back of the picture. Document to confirm the medical or disability condition (See Section IV, D for the required document). Obtain the form from any of the PWD Registration Centers. 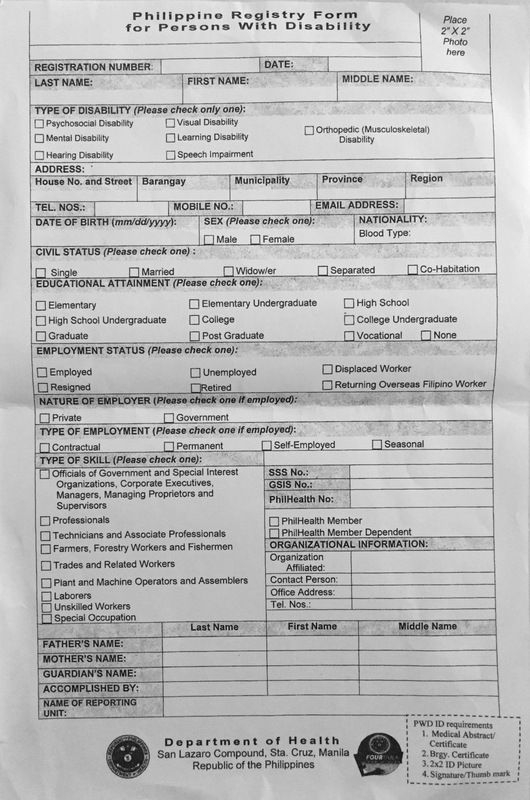 (Download: Sample PWD Registration Form). Fill up accurately and completely the form. Affix one (1) ID picture on the accomplished form, and staple the other ID picture with the PWD-RF. Attach copy of the document to confirm the medical or disability condition with the PWD-RF. Log in to the DOH-PPWDRS and access the online registration. Enter accurately and completely the required PWD registration data. Check and/or verify the data and document to confirm the disability or medical condition of the applicant. Assign a PWD ID Number (See Section IV, E) and affix on the PWD-RF. Fill up the data required on the ID Card. Issue the ID Card to the PWD. Submit the Accomplished PWD-RF and attached requirements and/or documents to the City or Municipal Social Welfare Development Office for data encoding into the DOH-PPWDRS. The PIC issued to the PWD shall be valid for three (3) years. The initial PIC is free of charge. Renewal due to expiration, loss or damage shall be charged a minimal fee for the new PIC. PWD card is being accepted in Mercury Drug Store and Pure Gold but the system is different in each. Requirements: doctor’s prescription, PWD ID Card and Medicine Purchase Booklet. You get the whole 20% before tax discount. Usually the discount is only applicable to a week’s worth of medicines (for example tables of Caltrate Plus with discount, good for one week). Some branches of Mercury Drugs Store allows you to avail of the 20% discount for bulk purchases ( for example you buy the 100pcs of Caltrate with a 20% discount). Requirements: PWD ID Card and Purchase Booklet. Pure Gold has a standard discount of Php65 per Php1,300 amount of purchase. Php65 is only 5% of Php1,300.